The ThinkPad will not boot. To check if your power adapter is broken, plug it into your ThinkPad and look for a charging indication light. If the light does not illuminate, the power adapter may be broken. If you are still unsure, remove the battery and plug the power supply into the ThinkPad. If the ThinkPad still does not respond, replace your power adapter. If your battery cannot hold a charge, your ThinkPad will work with a power adapter but will not work when unplugged. If this is the case, see if this is the case. If so, remove the battery and order a replacement. If the computer boots up but crashes while loading Windows XP, your RAM may be bad. Ensure your RAM is seated correctly into the ThinkPad. If the problem persists, run a memory test such as MemTest. If the test finds any issues, you may need to replace the RAM. Your ThinkPad's screen is frozen, blank, or visibly damaged. Try turning your computer off and on again. If the problem persists, ensure your video and graphics drivers are up-to-date, or if they were recently updated, try to uninstall these updates (this may seem counter-intuitive, but if it worked before a new update, the update may not be necessary). 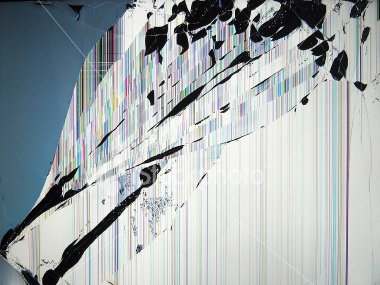 If your screen is cracked or is displaying a white or line-filled screen with a shatter pattern (for example, something like this), your screen has been physically damaged and you will need to replace the screen. The computer boots, but the keyboard does not respond to any input. If you recently installed any alternate keyboards for typing in different languages, make sure you are selected on the default English keyboard layout. To do this, click Start and then Control Panel. If you are in Category View, click on "Switch to Classic View" in the top left corner of the window. Then click "Regional and Langauge Options," then the "Languages" tab. From here, change the input language to English. If the keyboard still does not register any input, it may be a hardware issue. Try tapping the Caps Lock key (located on the left of the keyboard) to check if the indication light lights up. If the light does not appear, and you have ruled out software as a possible issue, you may need to replace the keyboard. ''The optical drive is not reading any disks, making abnormal sounds, or not responding at all." There are many different formats for optical disks. The IBM ThinkPad T30 is capable of playing CDs and DVDs. This does not include HD-DVDs, Blue-ray DVDs, or 3D movies. Please make sure that you are using a supported optical disk with your computer. Sometimes the optical drive cannot read the disk because the disk itself is unreadable. Clean away any smudges, dirt, or grime on the disk and try to play it again. If the disk is significantly scratched or damaged, then it may be too damaged to repair and may need to be replaced. If you are unable to play a clean and supported disk with the optical drive, your optical drive may be broken. You may need to replace your optical drive. No sound is coming from the ThinkPad's speakers. If the speakers are not functioning the problem may be software-related. Make sure the drivers are properly installed and up-to-date. If that is not the case, you may need to replace your speakers. The ThinkPad's fan is very loud, abnormally quiet or not functioning, or the ThinkPad is dangerously hot to the touch. The ThinkPad may shut down automatically because it gets so hot. Accumulated dust or other debris may be jamming the fan. Use a can of compressed air to clean the holes and crevices of your ThinkPad. If this does not help, you may need to get disassemble your ThinkPad to clean the dust inside directly. If cleaning out the fan doesn't fix the issue, it may be time to replace the fan assembly.